FATBERG! 15-Ton 'Lump Of Lard' Removed From London Sewer : The Two-Way It's the largest congealed lump of wet wipes and food fat ever found in the city's sewer system. Workers spent about three weeks working to hack it up and haul the pieces away. If they hadn't, raw sewage might have started spurting out of manhole covers. 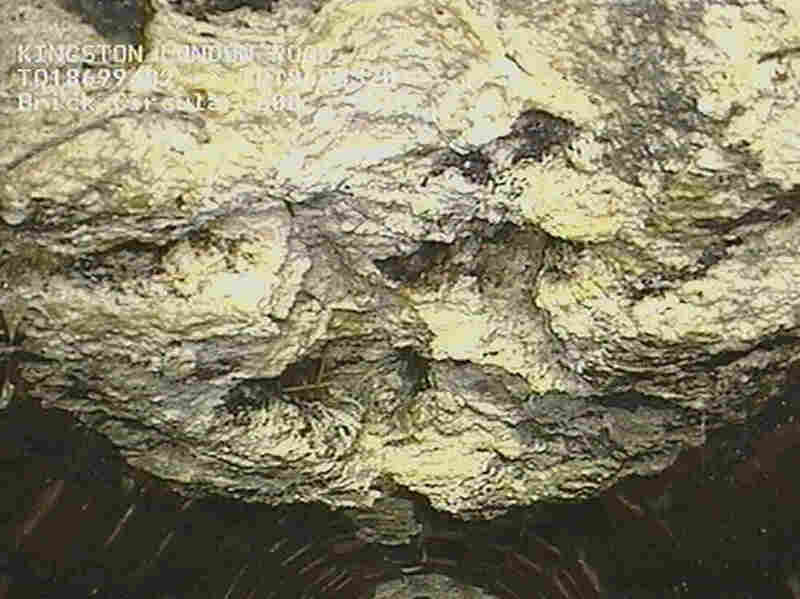 That's a lot of fat: A photo showing some of the 15-ton "fatberg" that was clogging up a London sewer system. Set this post aside until after lunch if you have a sensitive stomach. A " 'bus-sized lump' of food fat mixed with wet wipes" has been removed from a southwest London sewer, the BBC says. The 15-ton behemoth was the largest "congealed lump of lard" ever found in the Thames Water sewage system, supervisor Gordon Hailwood says in a statement. Nearby residents were reporting that their toilets wouldn't flush because the system was so clogged. It took three weeks to hack the monster into pieces and haul them away in "heavy duty lorries," Hailwood also said. "The sewer was almost completely clogged with over 15 tons of fat," Hailwood says. "If we hadn't discovered it in time, raw sewage could have started spurting out of manholes across the whole of Kingston. "It was so big it damaged the sewer and repairs will take up to six weeks. "Homes and businesses need to change their ways, when it comes to fat and wipes, please remember: 'Bin it — don't block it.' "
We also want to note that there's video of the fatberg from inside the sewer. Here's one time our standard warning really rings true: Think before you click "play" about whether you really want to see what was down there.